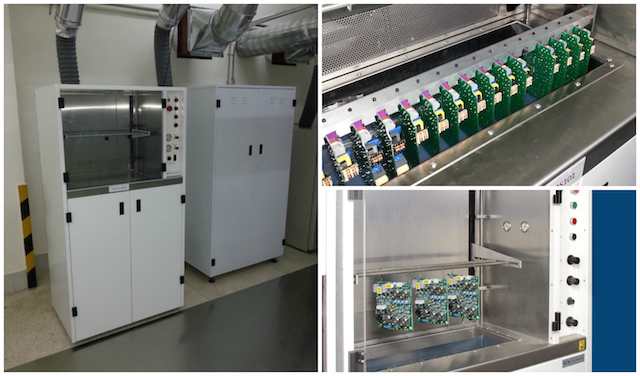 The DS101 Conformal coating dip system is a precision built, floor standing, conformal coating dip machine. It is designed for medium to high volume batch processing of printed circuit boards. The system operates on compressed air only. Being entirely pneumatic the machine is safe to use with flammable materials. It also reduces the cost of expensive electronics required with explosive solvents. 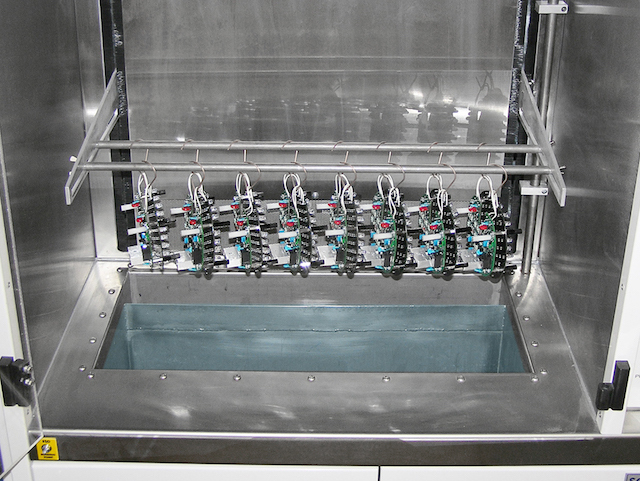 The machine uses an air over oil pneumatic system for precision regulated speed control of the dip process. The automatic dip cycle process provides a smooth immersion and withdrawal rate which eliminates air entrapment and ensures an even film. This allows a wide range of conformal coatings to be coated with repeatable high tolerance of conformal coating thickness to be achieved. 50mm wide rear weir, 150mm deep for easy clean. The system is constructed of powder coated steel frame with solvent resistant stainless tank internal panels and tank. System is pneumatics only. No electronics are used. Dimensions: ( approx) 1795 mm high x 950 mm wide x 590 mm deep. Dip tank: Stainless steel. Usable area is approximately 600 mm long x 200 mm wide x 300 mm deep with a 50mm wide rear weir, 150mm deep for easy clean. Tank Capacity: approx 40 litres. If you’re planning to install a piece of equipment, please check the exact specification of the brochure with us. All details shown in all brochures are subject to change between publication dates. Using custom masking boots for the conformal coating masking process saves time, money and improves quality. Find out why…. Why does the solids content of my conformal coating matter for costing a printed circuit board for application? What are the main uses of Molecular vapor deposition (MVD) in protecting components? What are conformal coating masking boots and why do they save you money? What are the different methods available for cleaning electronic circuit boards? What is a fluoropolymer nano coating and how can it protect my circuit board? Do you need UL qualification for your conformal coating? How do I selective apply my conformal coating?